We offer a full line of ductless split air conditioners from the top manufacturers including Mitsubishi. 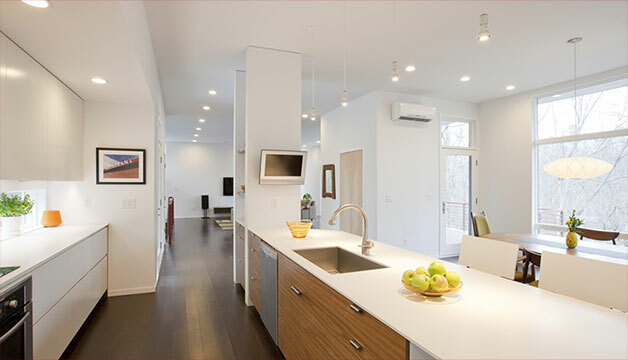 For older houses that do not have the proper ducts in place to support an air conditioning system, a ductless split air conditioner is a great option allowing for single room temperature control as well as multi room. Similar to a range hood over your stove, these cooling products allow you to add air conditioning to the areas of your home that need it. This is a very popular option in older communities such as the Glebe in Ottawa. We specialize in custom cooling solutions that will give you the best in total indoor air comfort. Many of our units are whisper quiet providing cooling without you even noticing it is running. AirZone HVAC Services carries a full line of ductless splits to compliment your home and keep you cool in the summer. We even have an innovative picture frame product that will cool your home while displaying your favourite picture!